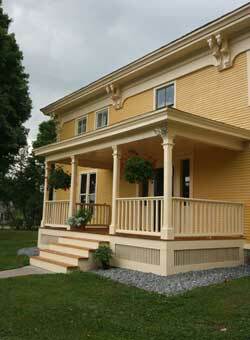 Exceptionally charming 1790 Federal center hall home with 1860’s Italianate details. On the historic register; Character and history abound in this truly unique property. Exterior painted Summer 2007; original details brought back to life! Convenient and beautiful post and beam breezeway. This space easily accommodates two cars or is a wonderful entertaining space. There is also a one car detached garage, adjacent to the shop area. 22 x 37 insulated shop space with radiant floor heat renovated in 2005; currently an antique restoration business; Just use your imagination: artist's studio, yoga studio, classroom, rec room, in-law/au pair suite, apartment, office space, the possibilities are endless!